A local pastor hopes his new book will give guidance to modern Christians looking for a new model by which to live their faith. The Fine Line, written by the Rev. Kary Oberbrunner, is set to be released Friday, Dec. 5. Oberbrunner, 31, is a pastor at Grace Church in Powell. He lives in Dublin with his wife, Kelly, and his two children. Oberbrunner’s father was a pastor, so he grew up in a Christian home — and he has seen statistics that show as many as 60 percent of young people who grew up attending church stop attending church by age 25. Some think they need to abandon culture in order to be Christian, but Oberbrunner hopes to show them that is not the case. “I realized that a lot of my generation is leaving the church, leaving their background, so I wanted to give a model that would … invite them,” he said. Oberbrunner knows the first two groups well because he has been part of them at times, he said. 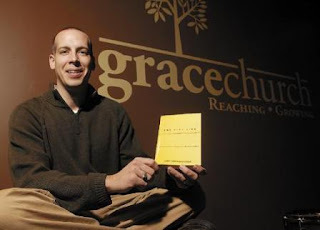 Oberbrunner and his church have been striving to engage in transformist behavior, and one example he points to is the free health clinic Grace Church puts on at the Andrews House in Delaware on Wednesday evenings. All the doctors and nurses volunteer their services, and prayer services are offered for those who want them. “Our church is trying to be a church of transformists, and one of the ways we’re doing that is giving people free healthcare,” said Oberbrunner. The church also works with Clintonville-based orphanage effort Asia’s Hope, which helps rescue children from human trafficking situations. But one of Oberbrunner’s best examples of the model in action stems from a man he saw struggling with an MP3 player at a local YMCA. Such actions in the interest of integrating Christianity with culture are at the crux of what The Fine Line is about, Oberbrunner said. More information on The Fine Line and on Oberbrunner himself can be found at his Web site, karyoberbrunner.com. Oberbrunner will appear at Grace Church, 7600 Liberty Road, for a talk, question-and-answer session and book signing, titled “Walk the (Fine) Line,” Dec. 15. The event, which runs from 7 to 9 p.m., is free, and the book will be for sale at a discounted rate.